Classic Model Cars (USA) is pleased to present to you its recent and forthcoming releases at the 2016 Nuremberg Toy Fair. You are looking at a multitude of new, innovative items that cover a wide range. We would like each collector to find his or her "dream model(s)" below. For Alfred Neubauer, the head of the Mercedes-Benz racing department, only one victory was missing - winning the Carrera Panamericana, a long-distance race in Latin America. With four competition cars and a team of 35 service people, the crew flew to Mexico in November 1952. The engine displacement of the 300 SL had been increased to 3.1 liters, producing 177 hp. Kling's car collided with a vulture 50 km ahead of the finish, which broke the windshield. The windshield was then protected by a metal grid, and Kling, in car No. 4, took first place. Hermann Lang in car No. 3, also a Mercedes 300 SL, finished in second place. Developed by Ferdinand Porsche, this race car made history in a way that virtually no other race car had done before. 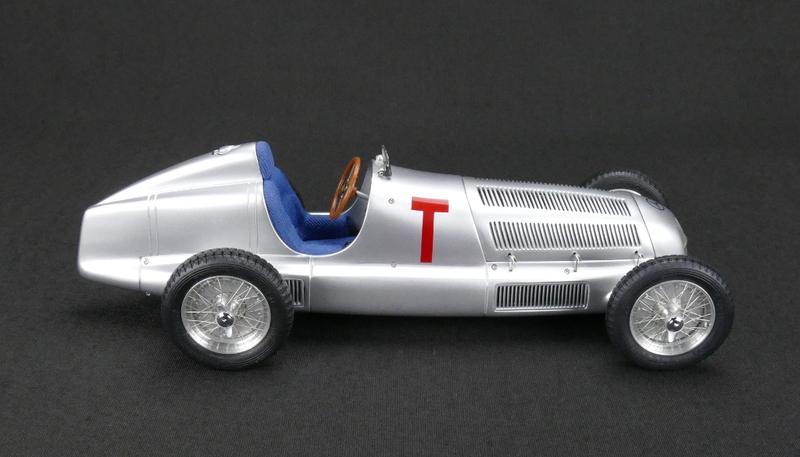 With the Type C in 1936, Auto Union introduced a Monoposto that was almost totally different from all other race cars up to that time. The most striking feature was the unconventional design of the sensational 16-cylinder V-type engine installed behind the driver and ahead of the rear axle - an innovation which soon became an accepted practice. Perhaps the greatest reason for the success of the 520 hp "bullet" was its highly talented race driver: Bernd Rosemeyer. In 1936, which was his most successful year, he became the European Champion and won numerous Grand Prix races. 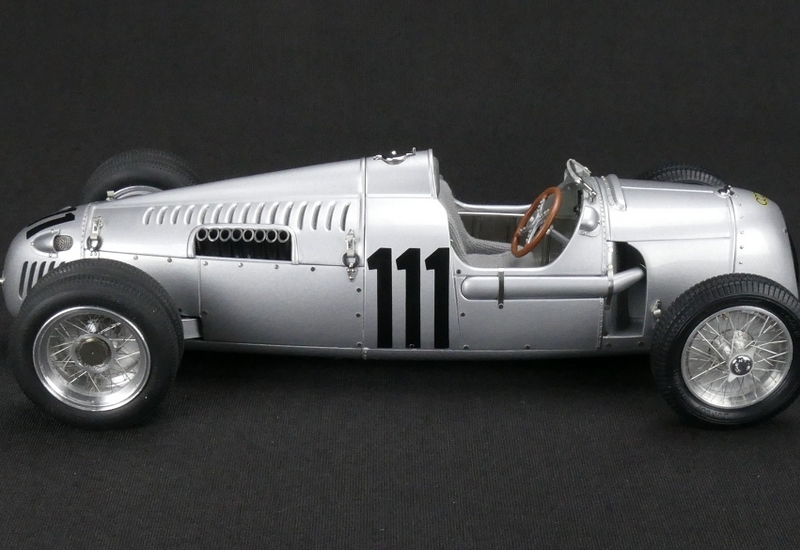 In 1937, this new ace of Auto Union kept his main competitor, Mercedes-Benz, in check, and was able to continue his successful career with five more wins. At the beginning of 1938, however, his career came to an abrupt and tragic end due to a fatal accident that occurred while he was trying to break the world speed record. After the end of the Second World War, the remaining race cars in Zwickau were turned over to the Soviet Union as reparation payment. It is still unknown what exactly happened to the race cars. 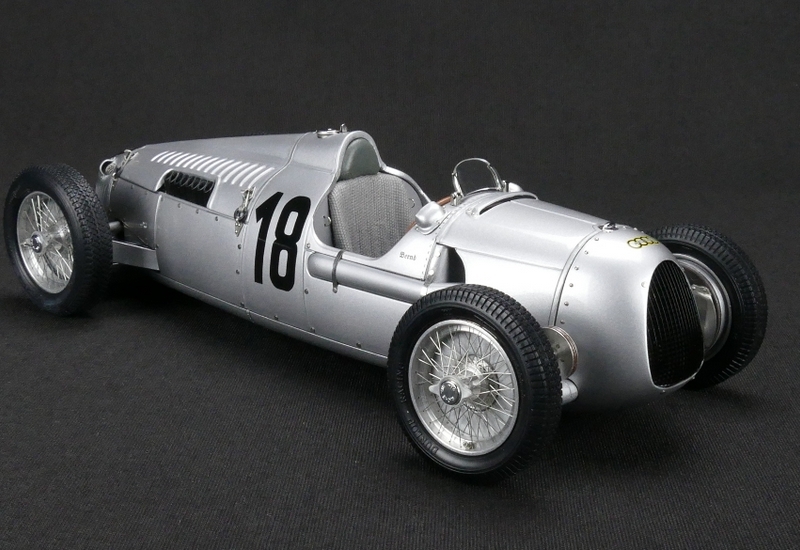 The Auto Union Type C is hand -assembled from 1026 parts into an extraordinary precision model. The individual parts are made of high-quality materials: 23 parts are zinc die-cast, 754 are metal or copper, and 153 are made of plastic. The remaining 96 parts are screws, rivets, or simulated screw heads. For years, the "Blue Wonder" was one of our best sellers. That was no surprise if you consider its aesthetic configuration and multiple functional parts. Choice materials and perfect workmanship, together with a deep blue high-gloss finish, made this replica a collector's item that belonged in a special class. Years have elapsed since this model was sold out, and it is time to put an end to such a dearth. But instead of producing a remake of the old M-036, we are introducing a new version that incorporates newly discovered exterior details and accessories from the archives. For example, the chromed wheel covers, an embellishment of Mercedes star inlaid in the front, and auxiliary head lamps with orange-colored lens. Furthermore, there are additional stone-chipping guards on the rear fenders, a rear plate illuminating system with two reflectors, and an oval national symbol "D" on the rear bumper. This new edition will be ready for delivery during 2016. After all, your W196 Monoposto, and Streamliner as well as 300 SLR Mille Miglia and Uhlenhaut Coupé need to have their transporter back! In 1954, the Mercedes-Benz' experimental department developed a hand-crafted, one-of-a-kind model -- the Mercedes-Benz Racing Car Transporter. With a deep blue finish, soft curves of the body, and a top speed of 170 km/hr, the "Blue Wonder" touched off as much fascination as the racing cars that it transported. After Mercedes-Benz retired from professional racing at the end of 1955, the transporter disappeared from the public eye and was regrettably scrapped in 1967. In the early 90s, Daimler-Benz remembered the importance of this vehicle to its racing heritage. Under the direction of the Mercedes-Benz Classic Center, an official replica was resurrected. 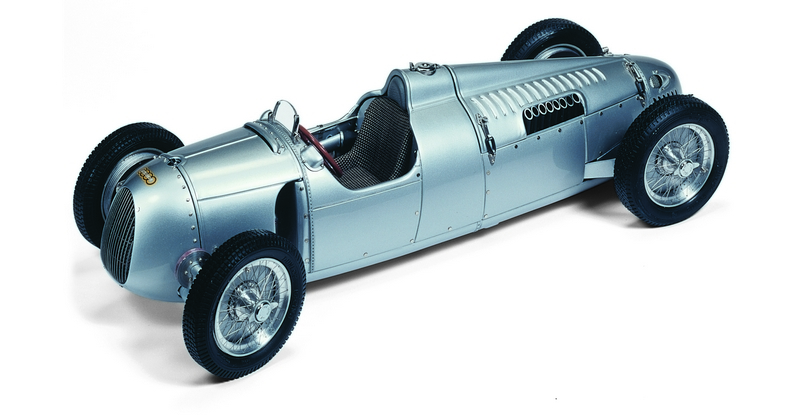 The Silver Arrows from Mercedes-Benz remain the classic icons of the 1930s that command high respect. This is not only true of such racing cars as the W25, W125, W154 and W165, but also of their drivers like Manfred von Brauchitsch, Rudolf Caracciola and Hermann Lang, who were considered top-notch pilots of the time. Not quite as prominent and yet always influential on the public image of the Silver Arrows, however, were their carriers. The blue trucks with the lettering "Mercedes-Benz Rennabteilung (Racing Department)" were always a symbol of the will and determination to take on even the hardest competition. Access to its officially replicated Type LO 2750 was kindly provided by Mercedes-Benz for the development of our miniature. Equipped with a 65 hp diesel engine, the Mercedes-Benz racing car transporters contributed to the huge success of the Silver Arrows in the 1930s. They were responsible for bringing the cars to the GP race tracks in time, maintaining the supply chain from the factory, and even serving as garages for repair work. Now and then they were used for presentation purposes. After a huge win, they trucked a victorious Silver Arrow under a furled tarpaulin cover to the enthusiastic audience. For a major race, a whole fleet of transporters was in use. But unfortunately, not a single one of the original transporters survived -- all the more reason for us to bring it back as a high-end replica. Item No. M-155, Limited Edition 1,500 pcs. 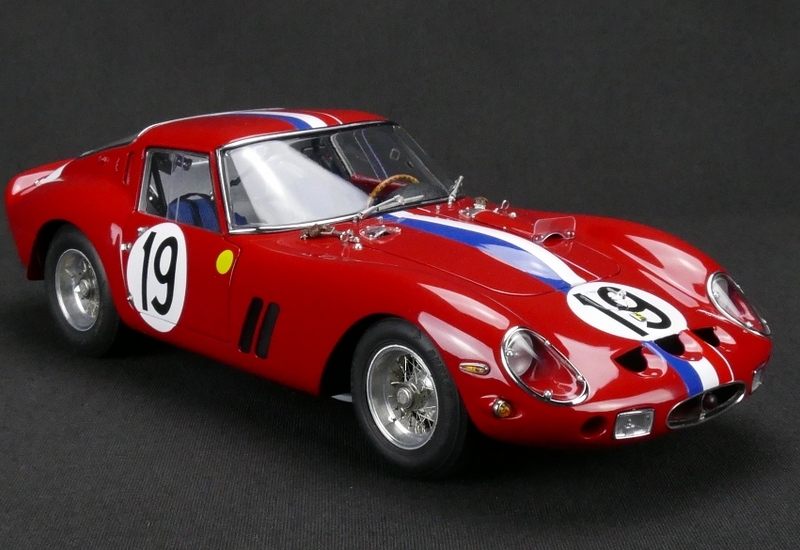 A highlight of the 30th 24 Hours of Le Mans that took place from June 23rd to 24th, 1962 was the debut of the newly-developed Ferrari 250 GTO, which went into the race with high expectations and optimism. The race was the 8th series run of the World Sportscar Championship of the year. What was new was the classification of participating vehicles into 18 different racing classes. In the experimental class, the driver-duo Olivier Gendebien /Phil Hill raced a highly powerful Ferrari 330 TRI/LM Testa Rossa Spyder to the first place in overall standing. For the GT class, Ferrari had a new trump card -- the Belgian driver-duo Pierre Noblet/Jean Guichet in 250 GTO Chassis #3705 with the license plate MO-77914. This was a team with seasoned experience in endurance racing as well as prudent and outstanding driving skills. Fifty-five teams started off on the course. The Olivier Gendebien/Phil Hill team finished first in overall standing after completing 331 laps that totaled 4,451.255 km in 24 hours. Their average speed was 185.469 km/h, with Phil Hill driving the Spyder to establish the fastest lap time at 3.57.700 minutes, 204.202 km/h. 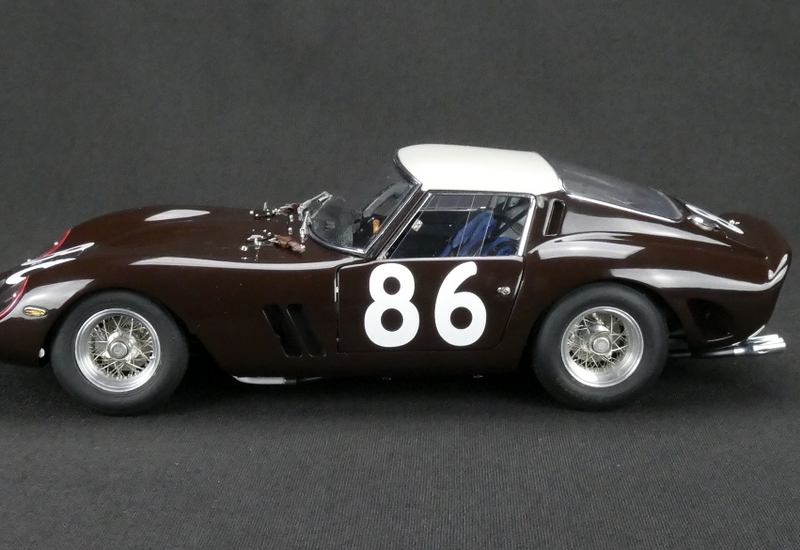 Also remarkable was the result achieved by Pierre Noblet /Jean Guichet, the GT-class winner team in its Ferrari 250 GTO with starting #19 on a blue, white, and red tricolor-striped body. They covered a distance of 4,384.136 km in 24 hours, completing 326 laps at an average speed of 182.67 km/h. In addition to their first-place finish in the GT class, the remarkable performance led them to a 2nd position in overall standing. Three of the participant GTO's finished in the top six places, thus making Le Mans 1962 one of the most successful racing events for Ferrari to this day. Item No. M-156, Limited Edition 1,500 pcs. Item No. M-157, Limited Edition 1,500 pcs. Tour de France Automobile was launched in 1899 and held almost annually till 1986. Its first post-WWII race in 1951 marked the beginning of a "golden era" that would come to a conclusion in 1966. In the course of time, Ferrari provided a benchmark with its sophisticated GT cars. Between 1951 and 1962, the Scuderia won eight times in the overall standing. Tour de France Automobile 1964 took place from September 11 through 20 in France and Italy. Manning a Ferrari GTO (chassis #4153), the Belgian driver pair Lucien Bianchi/Georges Berger joined with other 116 competitors to start off in the city of Lille. During the next nine days, competition unfolded in six stages, covering a total distance of 6,060 kilometers that ended in Nice. Only 36 teams made it to the finish in southern France. As always, participants had to complete a protracted drive through France that was timed by stages, but this time a visit to Monza, Italy was included. Altogether the long drive consisted of circuit races on the racetracks of Reims, Rouen, Le Mans and Monza in addition to mountain races at famous Col du Tourmalet, Mont Ventoux and Col de Turini. The first appearance of an American racing team had caused some sensation. It was none other than Carroll Shelby himself who signed up three Shelby Daytona's for the starting grid. At first, these 380hp coupés dominated the race, but they all retired in the third stage because of some serious accidents. 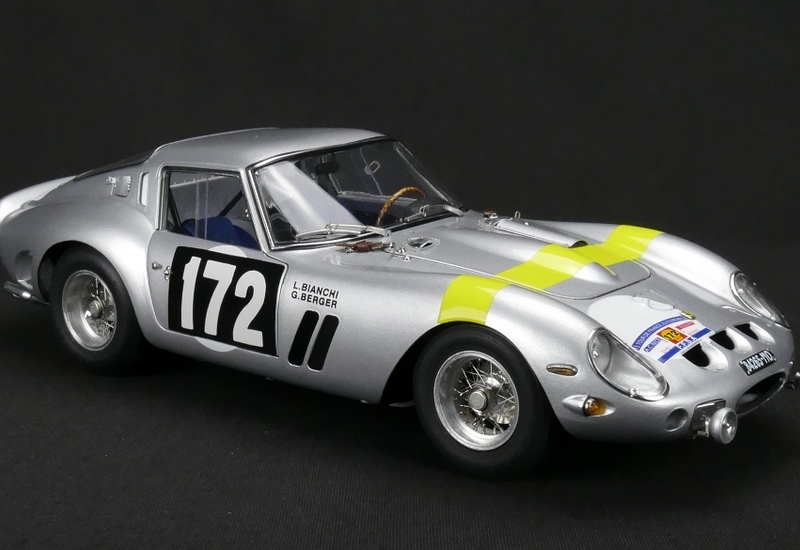 Eventually, a 250 GTO took over the lead like so many times before: Piloting their GTO with starting number 172, Lucien Bianchi and Georges Berger became the overall winner in the GT class. Once more the GTO turned out to be the standard-bearer. Item No. M-161, Limited Edition 1,500 pcs. On June 14th 1936, Auto Union sent its best driver Bernd Rosemeyer to compete in the famous Eifel race at the Nürburgring, piloting an Auto Union Type C with starting #18. This event became one of the most memorable fog-races at the Nürburgring. The race consisted of 10 laps for a total distance of 228 km. From the very beginning, it was dominated by three prominent drivers of the time. Leading the way was Rudolf Caracciola in a Mercedes W25, followed by the veteran driver Tazio Nuvolari in an Alfa Romeo P3, and then Bernd Rosemeyer in a Type C. After the 3rd round Nuvolari surpassed Caracciola to take the lead. But Rosemeyer was catching up steadily. Following a shock absorber failure that forced Caracciola to retire, a thrilling duel for victory unfolded between Nuvolari and the daredevil Rosemeyer. True to his nickname, Rosemeyer became an undisputed front-runner by the 7th round. At a significant distance behind him was Nuvolari, running in the 2nd place. During the 8th round, however, something unforeseen happened. With the sudden descent of a heavy fog, the Nürburgring was enveloped in an impenetrable wall of mist. Visibility was reduced to less than 20 meters! And what did Rosemeyer do? This crazy guy kept going full speed ahead. With a seriously blurred vision, he had to rely on his route memory of the course, a 7th sense for orientation, and an undaunted spirit to win the race. A legend was born. Bernd Rosemeyer went down in racing history as the "Fog Master." Auto Union was setting a new benchmark that put an end to the dominance of Mercedes Benz. Item No. M-162, Limited Edition 1,500 pcs. Hill climbing always offers a variety of excitement in motor sports. By the 30's, it had become very popular with an increasing number of Grand-Prix racecars getting involved in its races. Befittingly Auto Union held a special position, as they had an extraordinary skilled driver Hans Stuck, who was known as "King of the Mountains" because of his numerous hill-climbing victories. The legendary hill-climb track at the Schauinsland Mountain near Freiburg was internationally famous. The first hill-climbing race took place there in 1925. In the following years the race grew to be an international competition, which often attracted more than 20,000 spectators during the golden era of the Schauinsland hill climbs in the 30's. This was very true of the 13th Schauinsland hill climb, which was part of the German hill climbing championship; it took place on August 1st,1937 and boasted a list of drivers from 10 different nations. Most noteworthy were the two top racing teams: Auto Union with Hans Stuck and Bernd Rosemeyer and Mercedes-Benz with Rudolf Caracciola, Manfred v. Brauchitsch and Hermann Lang. The race-track was 12 km long, leading all the way to the top of Schauinsland Pass with 178 turns for drivers to negotiate and an ascent of 780 meters on slopes that could be 12° uphill. At the end of the race, Hans Stuck lived up to his nickname, driving his #111 Auto Union Type C with twin-tire rear wheels to victory by one second ahead of his team mate Bernd Rosemeyer, who was also on a Type C, but with single-tire rear wheels. Mercedes-Benz didn't have a chance that day. Rudolf Caracciola and Hermann Lang, each on a W125, finished 3rd and 4th. Back then the drive-axle was often fitted with twin tires in order to improve the transmission of motor torque onto the road. This resulted in better traction and made it easier to control the veer-off forces in narrow hill curves. But ultimately, it was not only the engine power, but also the driving skills and, above all, the cornering technique of a pilot that were essential for winning the victory. Our hand-crafted metal precision model is a replica of Hans Stuck's winning vehicle with starting number 111 and twin-tire rear wheels. Limited Set Edition 1,000 Units. 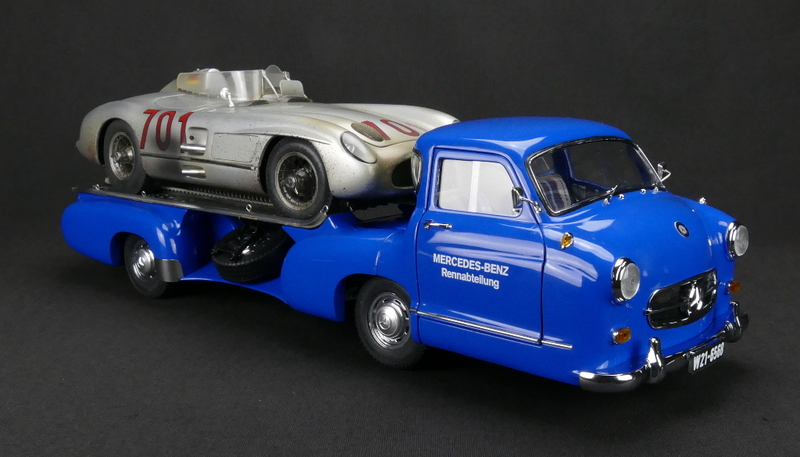 With this limited set, we're introducing a 1955 Le Mans version of the Mercedes-Benz Racing Car Transporter "Blue Wonder" and a Dirty Hero version of the Mercedes-Benz 300 SLR Silver Arrow with starting #701 that was driven by Karl Kling. This set represents the journey home from a racing scene. The piggybacked car shows mud splashes, a soiled grille and fume-smothered body that arose from a heated race. This double-piece set is limited to 1,000 units only worldwide. Equipped with a 65 hp diesel engine, the Mercedes-Benz truck LO 2750 contributed significantly to the huge success of the Silver Arrows in the 1930s. They were responsible for bringing the cars to the GP race tracks in time and maintaining the supply chain; after a huge win, they would truck a victorious Silver Arrow under a furled tarpaulin cover to the enthusiastic audience. 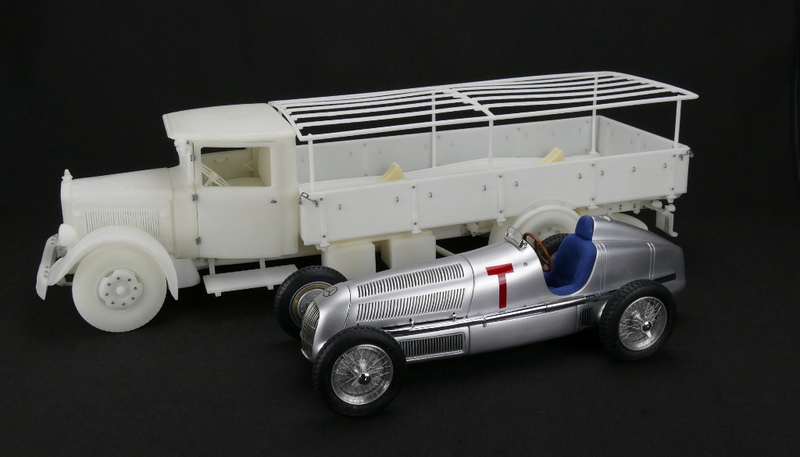 We're introducing a limited set version, with each unit comprising a Mercedes-Benz Racecar Truck LO 2750 marked with wagon number #2 and a Grand Prix training version of the Mercedes-Benz W25 Silver Arrow marked with a "T" instead of the starting-number. Neither of the two models that constitute the set is available separately from M-164, which is limited to 1,000 units only worldwide. Item No. M-165 (Silver/Red) Limited Edition 1,500 pcs. Item No. M-166 (Black) Limited Edition 1,500 pcs. 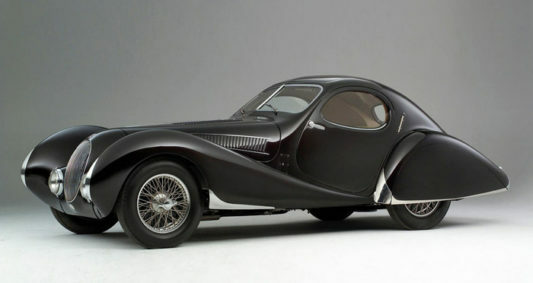 A dream car featuring a "teardrop" body that remains unrivaled in elegance and styling since it was sired by the coach-building virtuosos Figoni & Falaschi. Many experts around the world would agree that this car belongs in a category of its own due to its styling that transcends the common sense of automobile aesthetics. The T150 C-SS had such an avant-garde appearance that it virtually gave the illusion of coming from a different planet. The car qualified as a masterpiece of what we would call "state of the art" today. 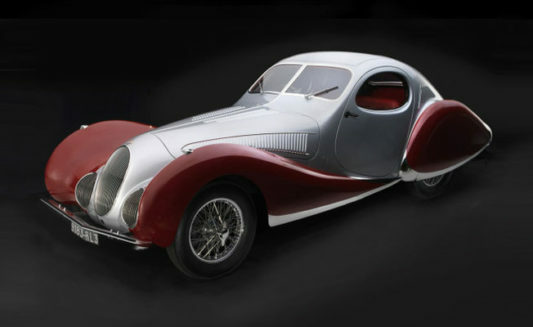 When it debuted at the Paris Motor Show in 1937, spectators were literally struck breathless. Soon the French term "goutte d'eau" was adopted in reference to the car, but it was its English translation "teardrop" that became widely used. This epithet, whether in English or French, did great justice to the extraordinary looks and configuration of the vehicle. Everything about this car, down to its minute details, testifies to a love to the degree of an obsession for the beauty of shape in motion. Each curve and line alignment blend into each other without appearing obtrusive. From the sleek front fenders to the chrome-plated exhaust tail pipes, the vehicle forms a harmonious whole. In addition, it is equipped with a metal sunroof -- a luxury rarely seen back then -- and a plush interior decked out in classy woodwork and fine-grained leather. In 1937 Anthony Lago signed a contract of exclusive cooperation with the already world-famous French coach-builder Giuseppe Figoni and his partner Ovidio Falaschi, and it led to the birth of a top-of-the-line model known as "Teardrop-Coupé", which was marketed between 1937 and 1939 with 16 units eventually manufactured. Each car was unique, either with differences that were barely perceptible or with detailing that was eye-catching. A good place to look is the arrangement of the headlights, which are either mounted all by themselves between the radiator grille and the fenders or recessed behind chromed metal-rod covers that are embedded in the front end. The first production series yielded 5 units, which were named after the production manager to be known as "Jean cart". 3 of these 5 units were mounted on a T 150 C-SS chassis with a short wheel base of 2,650 mm. Launched in 1937 at the New York Motor Show, the second production series yielded 11 units, all of which were fitted on a T 150 C-SS chassis with a short wheel base of 2,650 mm. 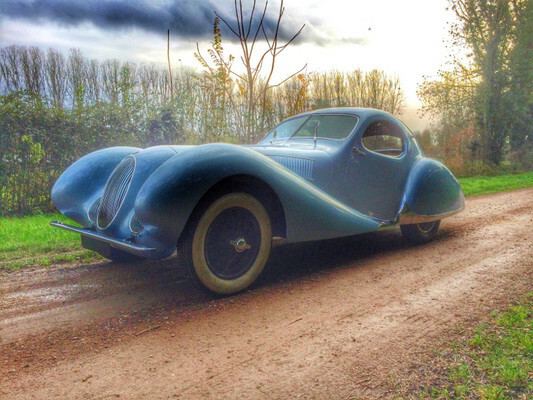 This series entered the annals of Talbot-Lago as "New York Style" model. Anthony Lago and his chief engineer Walter Breccia were technologically ahead of their time. Above all, credit should go to their innovative design, which enabled the production of a shortened and lightweight T 150 C-SS chassis. Further technical highlights of this extraordinary vehicle included single-wheel suspensions, a Wilson 4-speed preselector gearbox, excellent breaks, and a wonderfully smooth-running 4-liter 6 cylinder in-line engine, which delivered, depending on the model, an output between 140 and 160 hp. Because of this outstanding engine with powerful torque and the very good acceleration it provided, the "Teardrop Coupé" was also predestinated for racing sports. It was small wonder that a "Teardrop" won a superb 3rd place in overall standings at the 24 Hours of Le Mans 1938. CMC is introducing three high-end replicas of the "Teardrop-Coupé " in its contemporary appearances: one standard version that is finished in light blue with a red leather interior, one finished in silver and red with a red leather interior, and one finished in black with a beige leather interior. The two non-standard versions are each limited to 1,500 pcs worldwide. Item No. M-167 Limited Edition 1,500 pcs. The Talbot-Lago T150 C-SS, affordable only for very wealthy clients, also found its way into the famous race tracks of the world. There the French luxury vehicle was able to clinch some convincing victories and successes under the harshest conditions. 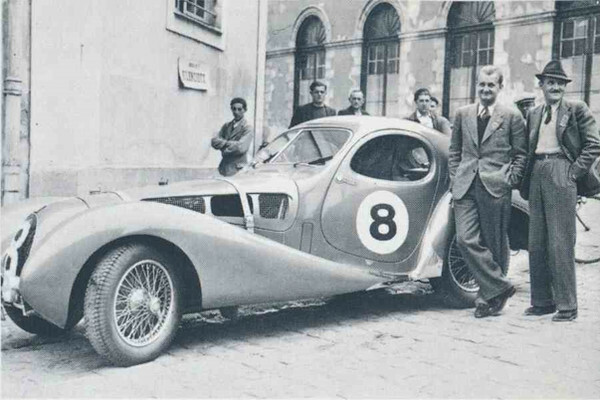 French racecar drivers Philippe de Massa and Norbert Jean Mahé drove this Talbot Lago 150 C-SS of the British racing team TASO Mathieson with starting number #8 at the 24 Hours of Le Mans in June 1939 -- the last racing event before World War II broke out. The 13.492 km-long track at Circuit de la Sarthe tended to exert murderous stress on engine and drivetrain components, and it also pushed the two French pilots to perform to the best of their abilities. Unfortunately, technical breakdowns did occur, forcing them to retire. With chassis #90117, this car had a historical appearance resulting from extensive modifications and a pickup of racing accessories that is different from the looks of a standard "Teardrop-Coupé". All the modifications was implemented meticulous into the race version. Item No. M-158 (green / #18) Limited Edition 1,500 pcs. Item No. M-159 (blue/ #20) Limited Edition 1,500 pcs. Item No. M-160 (red / #16) Limited Edition 1,500 pcs. 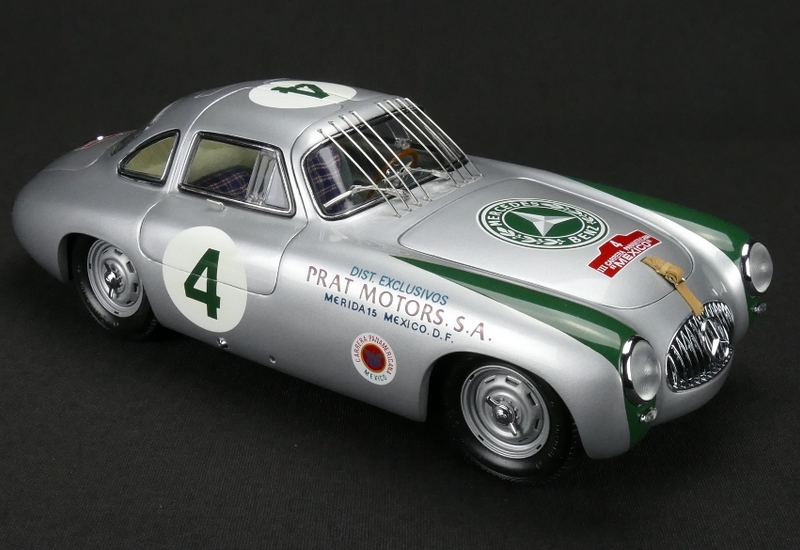 In 1952, Mercedes-Benz staged a comeback to motor sports racing with the newly-developed Type 300SL (W194). Featuring an unusual entry through a gull-wing door that opens from the lower edge of the side window and swivels upward around the centerpiece of the roof top, this streamlined sports car immediately cast a spell on the racing enthusiasts. After a successful debut at the Mille Miglia, the 300SL moved on to the renewed competition of sports car racing at the Grand Prix of Bern on May 18th, 1952. 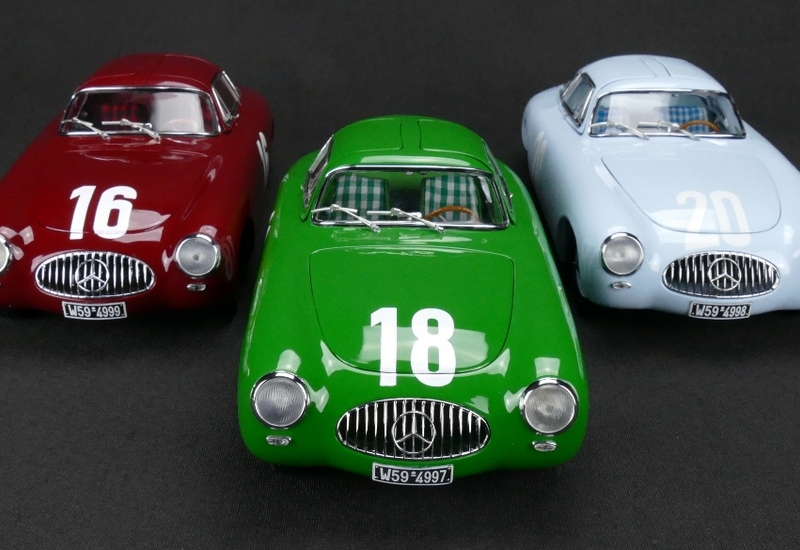 The three officially registered 300SL's were decked out in uncommonly colorful finishes, including dark red (Rudolf Caracciola, #16), green (Karl Kling, #18), and blue (Hermann Lang, #20), not to mention the silver-colored finish of the replacement car with Fritz Rieß (#22) at its wheel. The team was ready to engage the rivals from Ferrari, Lancia, Aston Martin and Jaguar. At the end of the race, Mercedes-Benz celebrated a spectacular triple-victory, with the 1st, 2nd and 3rd places clinched by Karl Kling, Hermann Lang and Fritz Rieß respectively. The joy of victory, however, was tempered because a tragic accident had happened to Rudolf Caracciola when he veered off the track on a stalled front brake and crashed into a tree in round 13. He was taken to hospital with a broken femur and other injuries. His recovery was long, and the bone fracture plus a knee surgery caused lasting impairment to his right leg, which put an end to Caracciola's racing career. 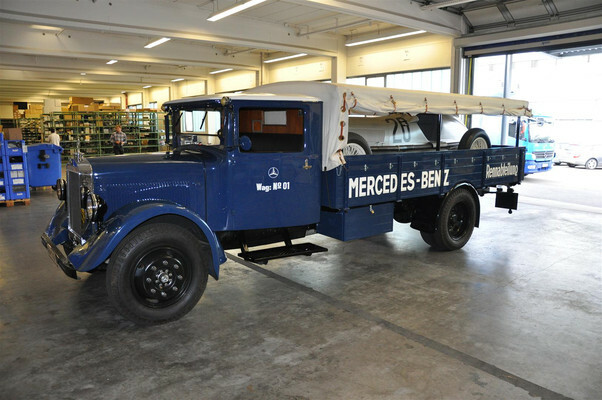 The robust and compacted Mercedes-Benz Truck LO 2750 with its fuel-efficient 65-hp diesel engine was a popular transport vehicle for small- and medium-sized enterprises during its heyday. Owing to its big loading space and a carrying capacity up to 2 ¾ tons that it offered, the truck was capable of fulfilling nearly all haulage-related tasks excellently. We are introducing a standard two-color replica of this successful truck with an open loading bed and functional guard boards. 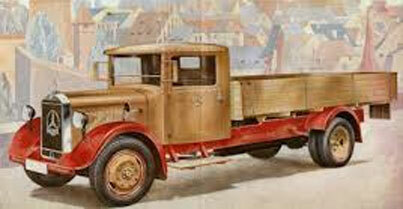 The hinged boards are made of real wood, as in the original truck. The beautiful contemporary two-tone finish will make this model a real eye-catcher in your showcase. As an alternative to the open-top platform truck, we are presenting the truck with a tarpaulin-covered platform in this edition. Made of real linen fabric, the tarpaulin is fastened onto a structural framework of the platform with ropes, hooks, and eyelets as in the case of the original, and the cover is removable. 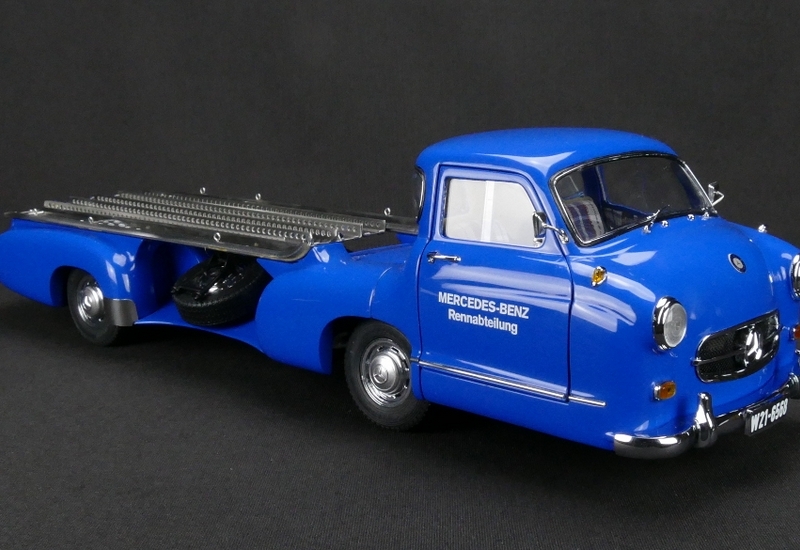 With this clear-finish edition of the Mercedes-Benz LO 2750 Truck that authentically features an open loading bed with functional wood-made guard boards, CMC presents a rarity that is clearly set apart from the old norm of what miniatures look like. Looking at this CMC miniature will make one realize how beautiful the model is without a colored finish on. There are a characteristically distinctive aura and a freshly-engendered charisma that put this miniature not only in bold contrast with painted ones, but also convincingly in a class of its own. Particularly self-evident in this clear-finish edition are its use of high-quality materials and the extraordinary craftsmanship that go into its making; both add to its value as a collector's item. To protect the surfaces from discoloration or erosion of patina, they are sealed with a clear coat.